It’s astonishing how quickly new languages and linguistic usages emerge as a result of technological change. The philosophers of the Enlightenment—in the pathos of their lucent, rational language—would probably be appalled by how radically the traditional conveyor of eternal meaning can transform itself within a few years. And even structuralism, two hundred and fifty years later, is no longer at the cutting edge with its proposition that it is language that speaks. In the work of Adib Fricke it is technology that speaks or causes to speak. The digital revolution has given rise to some novel yet concealed forms of parlance. Novel because they more fundamentally link semantics and grammar to technological procedures and possibilities than has been the case with systems of writing up to now. Concealed because their upheavals generally take place below the level of spoken language, where we can hardly see them. The languages of the digital era have not yet attained visibility, perhaps not even sayability. This is the project of Adib Fricke’s various works: to make visible the use of language after the digital revolution and to disclose its new written and spoken forms —inasmuch as the electronic ragbag of the Internet can still be included in this term. Any artist involved in linguistic research these days—and Fricke has been for many years through his enterprise The Word Company—has to deal with utterly new phenomena: entire libraries are stored within the space of a single chip; computers transform words into data; mobile phones write text messages like magic. So there is good reason to suppose that the “being of language” that Michel Foucault describes towards the end of The Order of Things, that this fateful, clamorous being is currently undergoing a process of change. It is a change that above all affects the relation of linguistic continuity and discontinuity. Since the Enlightenment we have been accustomed to understanding language as a continuity of writing, meaning, and importance. But on the Internet there is a fundamental discontinuity of everything linguistic; writing does not bear witness to a continuity of meaning but to the discontinuity of mathematical operations. This starts when a writing program can’t read a coding and delivers an alphabet salad instead of sense. In its digital state, writing is just as frazzled and chaffed as the data itself. Writing no longer promises the continuity of “hermeneutic homelands” (Friedrich Kittler); on the Internet words are data already, and we write at a precipice of alphanumeric signs and binary numbers. In other words, in today’s writing—in computer-aided writing—the basis of every word is bound to the abyss of technical operators. In this situation—which is comparable to the “discovery” of indigenous languages in the eighteenth century—an artistic philology is possible. But the artist as linguistic researcher doesn’t collect exotic languages from around the globe or travel the world like Alexander von Humboldt in search of ethnological and geological artifacts. Today’s linguistic researcher ranges through the Internet and observes contemporary speech and writing: taciturn fragments that reduce humanity’s greatest good to an accumulation of grimaces. No one speaks through the linguistic items with which Fricke works; his phrases no longer refer to an author or an expressive subject. That throne is now occupied by technological and anonymous procedures. When technology speaks, the subject falls silent. At the very least, since Hegel, linguistic philosophy has assumed that the subject constitutes itself—endows itself with selfhood—in its language. Given the linguistic scraps on the Internet we now have to assume that subjecthood is not constituted here, but dismantled. This is broken speech and writing; these are languages nobody has spoken before. If Emmanuel Lévinas once wrote of “memory that was never present,” Fricke shows us language that was never constitutive. As a linguistic researcher in a technical age, Fricke is undertaking an archaeology of digital writing. The phrases he presents no longer indicate their speaker but the technical procedure that generated them. They are not arranged according to a meaningful subjective order, but are the result of the indeterminate pressing of enter keys. At the moment of command there is no subjective putting into circulation of meaning, merely a series of computational operations scattering data into the spaceless space of the Internet. Foucault’s key epistemological question, “Who speaks?” is answered today by the anonymous hum of data. Language as a data collection owes nothing to established meaning, but arises from the alphanumerical processes of digital technology. For this reason Fricke subjects language to a series of analogous operations, which are similar in all his recent works. The initial procedure is the decontextualization and fragmentation of statements from a huge variety of Internet sources. This material is then organized into a new text corpus, which is the result and purpose of these procedures. As indicated by one of his titles, My Private Corpus (2006, discussed below), Fricke generates his own text corpora to provide the basic material for his work. What is a text corpus? According to Hadumod Bußmannn’s Lexikon der Sprachwissenschaft (Lexicon of Philology) a corpus is a “finite volume of concrete linguistic expressions that serves as the empirical basis for philological investigation.” Fricke’s works show that a “finite volume of concrete linguistic expressions” can also serve as the empirical basis for artistic investigation. Yet for the philologists of the Enlightenment the corpus was a sacrosanct concept. It bound together what was understood as “German literature,” or “Greco-Roman inscriptions,” or the “biblical tradition.” Texts deemed significant were passed on by the corpus to the guardians of a tradition, who administered their task with high-minded seriousness. These days, electronic text-corpus databases—such as the DWDS (Digital Dictionary of the German Language in the 20th Century) or the BNC (British National Corpus) used by Fricke—are a valuable resource for linguistic researchers of all kinds. The DWDS is a public text-corpus database with which particular contemporary linguistic usage can be investigated. Corpora are consulted in order to establish how a linguistic item is used, and they consist of sample sentences from various sources: public speeches and press articles, literature and nonfiction. In this way text-corpus databases provide a cross section of contemporary and historical linguistic usage. The databases and corpora compiled by Fricke are not the embodiment of long tradition, but are brought about instantaneously, more or less at the touch of a button. Their textual grouping has at times the coherency of a pile of old papers. Created in a few seconds, they subject language to the contingency of randomness. The arbitrariness of the private corpus leads to a contiguity of texts from quite different sources. Like an archaeologist whose excavations bring to light a whole range of artifacts, both significant and insignificant, Fricke works with a widely differing range of linguistic items. Once the extracts have been linguistically dismembered and entered into the artist’s own corpora, they are assembled and sorted in new ways. As an archaeologist of text corpora and databases, Adib Fricke works his way through vast amounts of anonymized text fragments and then recombines a selection of them. His private corpus is not ordered in terms of content, but with the cold-bloodedness of a machine, i.e., according to criteria that have as much to do with the hermeneutic homeland as algorithms, character sets, or alphabetical lists. The question asked of these corpora is not what a phrase is intended to say, but how many characters it has and how it can be combined with other fragments. The combinatory rationale here is an affront to common sense. Any Enlightenment philosopher (and any enlightened scientist) would have rejected such gibberish. Yet Fricke’s private text corpora have the expressive and cognitive potential that is also a feature of archaeological rubble. So the book A Gorilla in a Mirror contains not just a mere scattering of textual chippings, but the raw diamonds of insight. Such gems are also sought and analyzed by linguists who use digital corpora as an “empirical basis for philological investigation.” Today they work as a matter of course at the interface of language and machine, and their electronic databases are as self-evident as speaking subjects. The material that Fricke works with does in fact have a contemporary diagnostic potential—it is the same material used by scientists for their analyses. The private corpus also has its epistemological added value. Its digital muttering does not say nothing. On the contrary, on this side of scientific analysis it gives rise to insights of its own. Although we learn very little about speaking subjects, we find out a great deal about digital pronouncements. Fricke’s works never tell us whose words these are; speech disguises rather than reveals the speaker. But with a bit of luck these semantic ruins—which have come about not through time, but through technical operators that continually disperse and recombine our digital language—speak to us nevertheless. Fricke, however, undertakes his linguistic research not as a scientist but as an artist. This implies three things: First, he can negate the significative function of the speaking subject, i.e., he doesn’t need to worry about who said what. The statements don’t need to be verifiable or traceable to their originators in order, if necessary, to be called to account before the high court of scholarship—for we need to be quite clear here: in a scientific context, Fricke’s camouflaging of his material would be a sacrilege. Second, and also related to such a sacrilege, is the fact that Fricke has no need to reconstruct the original formulation of the statements or their speakers’ intentions. Similar to Sigmund Freud in one of his last texts, Constructions in Analysis (1937), Fricke is concerned with the construction of anonymous statements that attain a new status within the linguistic world. So what we have has less to do with something found than with something formed, less with reconstruction than with a construction that dissects what it displays. And third, Fricke can only display because he is not only working in the realm of the sayable. His artistic work also occurs within the visible, which in turn means that he can respond quite differently to his found semantic material than can the scientist. While scholarly findings usually gather dust along with the books in which they appear, Fricke imparts a distinct evocativeness to the languages of the digital age. His cross sections through text corpora have nothing of the dryness of scientific analysis, but are as suggestive as advertising slogans and as direct as pop art. So Fricke’s approach is both close to and remote from scientific procedure. In order to illustrate this dynamic it is helpful to look at a few of his works from the text-corpora cycle. Both the similarity and contrast to the scientific approach become clear, for example, in his first work with text corpora, Jam from Mexico (2003). The proximity to research is immediately established by the location of the work: two stairways in the Institute of Microbiology and Hygiene at the University Hospital Charité in Berlin-Mitte. The text corpus was made up of user input, which Fricke tracked down via complex technical procedures, on various search engines. People had entered such ingenious search terms as “kugelschreiber zusammenbauen,” “catch my wife cheating,” “hühnerbrust symptome,” or “evolution what went wrong.” Apparently the input keyed into the search engines of this world have generated a new type of linguistic usage that blithely oscillates between soliloquy and quest for the self. Fricke doesn’t examine these phrases sociologically or psychologically, (which would not be without interest). He doesn’t analyze them at all, but arranges them in a scientific institute to give them a new—nonscientific—visibility. Fricke’s defining work with digital text corpora is entitled My Private Corpus. Its subject matter is the language of art dissemination, which in recent years has brought forth some wild extravagances. Here too Fricke assembles a voluminous text corpus of Internet pronouncements (made by artists), and uses it to generate statements that were never made. The only person or thing that speaks is the anonymous mumbling of the corpus. It says, “I do the same thing/just playing around/it’s really strange/painters will paint.” This babble can certainly be understood as a satire on the linguistic capacity (or incapacity) of artists or an ironic accentuation of the theoretical language of art, which often enough switches between catchwords and platitudes—after all, in the art world things can be stated and published that would be trashed anywhere else. But My Private Corpus goes well beyond the gesture of irony. The work can best be described as an archaeology of the language of art dissemination. Fricke does not present statements by artistic subjects but an anonymized cross section of their utterances—the things that are said when artists bend over their works. This discourse analysis of the language of the art system does not examine individual speakers, i.e., artists—let alone their works—but taps into the strata of an involuntary linguistic event that occurs between artist and work. The procedure does not make coherent the meaning an artist attributes to a work, but the incoherency and comedy that sometimes come about through talking about works of art. However, this occurrence is only visible to someone who knows how to read an act of speech against the grain and to uncover its epistemic layers. And in fact, Fricke’s unseen shifting of the soil of digital language recalls Michel Foucault’s arduous investigation of declarative systems. Foucault describes the first problem of his Archaeology of Knowledge as “the constitution of coherent and homogeneous document corpora (open or closed, finite or infinite corpora)” and “the establishment of a selective principle (depending on whether one wishes to deal comprehensively with the documentary mass, or takes random samples according to statistical methods, or attempts to define the representative elements in advance).” And the remainder of the book also bears witness to the effort that can be put into corpora: grouping, ordering, and regrouping statements in order to endow their reformulations with a divergent visibility—to get language to say something other than what it says, to get it to reveal, finally, what it doesn’t say, and to make “readable what was never written,” as Hugo von Hofmannsthal wrote some time before Foucault. Fricke’s work goes well beyond linguistic criticism too, as shown in a further project with digital text corpora, Can’t simulate freedom, which he realized in 2006 for the group exhibition “Hannah Arendt Thinking Space” in the former Jewish Girls’ School in Berlin. As usual he maintained as great a distance as possible from the philosopher’s utterances. Instead of meekly paying his respects to her words (as some of the artists did in their contributions to the “Thinking Space”), in this work he reverses the analytical direction. It is not Hannah Arendt’s texts or public statements that are the basis for Fricke’s text corpus, but their rehashing on the Internet by admirers or interpreters. From these mumblings Fricke compiles a corpus that anonymizes the statements and unhitches them from their speakers. The phrases Fricke selects from his Arendt corpus are a precise cross section through various key concepts in the philosopher’s work and its appropriation in the digital world, and what remains of her unique writing is an anonymous “agglutination of words” (Sigmund Freud). In the present book Fricke is also interested in the intersection of various concept clusters and their use in the digital world. This is the first time he has realized his work with text corpora in book format. The space that in previous works was provided by the walls of exhibition spaces is configured in this art book by its pages. In a three-dimensional location the text corpora are spatialized; on the two-dimensional page they return, to a certain extent, to their original confines. A book works with a form of visibility that is different from an exhibition space. A Gorilla in a Mirror does not reproduce a gallery show or an installation; the book itself is the artistic work. It not only abandons the representative function of the catalogue but also breaks with the linear character of the printed medium. There is no particular pathway through the words, sentences, and fragments that appear here; the reader will search in vain for sequence. A Gorilla in a Mirror can be read from the front or the back or from anywhere in the middle. Fricke’s book A Gorilla in a Mirror seems to be a direct response to Eisenstein’s regretful sigh. Its content doesn’t take the form of a line but of a sphere, without a beginning or an end. It begins everywhere, on every page, and its skewed letters also have something spherical about them. The book’s nonlinear form is entirely appropriate to the subject matter of the work, which is complex enough. It is no longer a matter of relatively clearly defined fields like philosophy or the language of art. The central theme of A Gorilla in a Mirror is artistic productivity, a subject whose outer edges can be more easily identified than its content. The nonlinear form of the book can be understood as a statement about this, and it can even be speculated as to whether Fricke’s abandonment of the linearity of the book also represents a rejection of the conventional theories on the subject. In the end, this art book is as circular as the process of artistic productivity itself. In other words, in contrast to a theoretical discourse on artistic productivity, the subject is not dealt with scientifically or in a documentary manner here. A product, a work, a book is developed from the subject matter itself. In this book, artistic productivity is, as it were, made artistically productive. The printed space itself becomes creative. The book’s pages aren’t passive information carriers but active agents of the artistic work. This activation and dynamization can be read as Fricke’s essential statement about artistic productivity. Because of their inherent creativity, artistic products can never be adequately represented or documented—least of all in concepts that are creative achievements in themselves. This absolute creativity of creative activity can at once be seen in the design of the book. 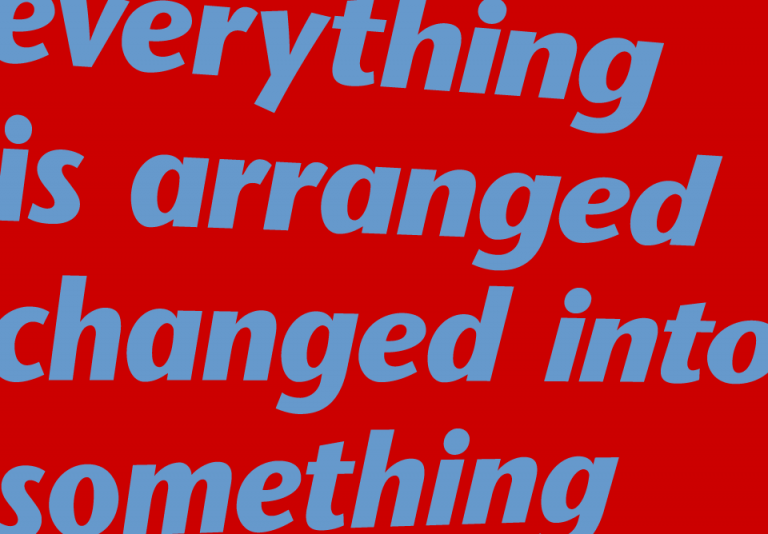 Its typography makes the texts leap into the reader’s eye with the immediacy of pop-ups. This has the important effect of causing these texts to “stand” on their pages quite differently from ordinary texts. The skewed letters have a spacey look to them, as if they were floating above the page. The text corpus on which this book is based is a complex one. Fricke benchmarked the subject matter with thirty-six concepts and keywords ranging from the usual art-theoretical suspects like “appropriate,” “beauty,” or “communication,” to generalities like “thing,” “word,” and “work.” An entire conceptual history could be drawn up for each of these items—Fricke simply took samples from across the board. Here too the concepts were unhitched from their authors, anonymized, and decontextualized. An artist, unlike a scientist, can get away with murder, as we have seen. The compilation of the corpus is similar to a multistage scientific analysis. Its basis was the above-mentioned thirty-six concepts, which were then used to trawl online databases for contemporary usages of words like “irony” or “humor.” This resulted in a further collection of raw textual material that Fricke processed once again. (Here he made use for the first time of his own text archive, which was also fed into the book’s text corpus.) So this work too is concerned with the interface of philosophically ennobled concepts (like “beauty”) and their use in the digital world. The entirely differing usages Fricke found were taken into the corpus and then dissected and dismantled by specially developed scripts into a vast number of phrases, from which—in another multistage procedure—he made a renewed selection that formed the final basis for the obscure statements that fill the pages of this book and scarcely betray their complex analytical genesis. A Gorilla in a Mirror contains such memorable phrases as “the theories of images/they prove nothing,” which can certainly be read as references to art theory. These stand in dialogue with others having the sheer peremptoriness of “our relationship to money/it has a global dimension.” These are flanked by thought-provoking sentences in the manner of “every idea must have a cause/to form an image in the mind,” or enigmatic musings like “all experience is coded/now I find myself alone.” Every page stares back at the reader with the same shrewdness as can be brought to bear on it. While these statements are already held in abeyance through their anonymity, their hallucinatory impression is further strengthened by their printed arrangement. The reader wanders pleasurably through a kaleidoscopic labyrinth of phrases and pronouncements without a beginning or an end and is finally encircled by statements the way a mirror ball glitters and spins in a disco. © 2008 Adib Fricke, translation (from German): Michael Turnbull.